Please note: This is a professionally refurbished item and we have limited stock available. It is being made available at a discounted price (dropped from $154). The printers are in excellent condition. Get a printer that makes printing easy. This HP Officejet e-All-in-One is a genuinely penguin friendly printer with current and future editions of your favourite GNU / Linux distribution supported. This model can be hooked up to many computers when connected to your network using 802.11 wireless technology, an Ethernet cable, or a single computer using a USB cable. 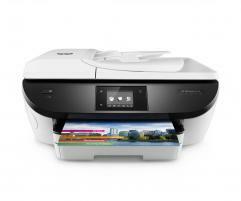 With this model you can fax, print, scan, copy, and connect it to multiple computers simultaneously through a wired or wireless network. HP 62XL Tri-color Ink Cartridge (415 pages). Compatible with Windows XP SP3 or higher (32-bit only), Vista, 7,8, 8.1; Mac OS X Lion, OS X Mountain Lion, OS X Mavericks (we provide no support for these operating systems). Compatible with FreeBSD 11+ (at least some earlier versions which have been updated will probably also work). Most distributions with a recent release are compatible out of the box. If you have any questions about compatibility or need a printer with support for an older distribution please contact us with the name and version of your distribution. Notes: Inkjet cartridges (2, set), printer, telephone, and power cable included. USB & LAN cables sold separately. This item is only available for shipping within the United States.